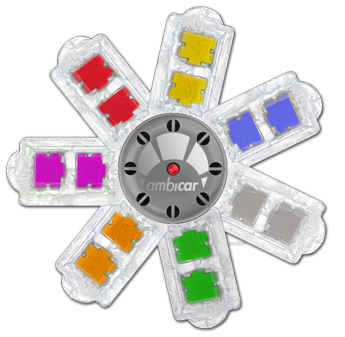 To give AMBICAR as a gift to a customer or business partner is without doubt a very original way to stand out. To relate your business to AMBICAR is guaranteed to signify innovation, quality, design as well as an active consciousness towards health and the environment. We can put your company name and logo on the Ambicar fragrance dispenser for your advertising campaign. Contact us and present your ideas and needs to us and you will receive an individual offer in any event. Our 7 fragrances are the basis from which you can combine your personal favourite scent! You like NATURE but you would like to add a whiff of an elegant perfume? Just combine NATURE with ELEGANCE. You are looking for absolute freshness and have a preference for citrus fragrance? The combination is called OCEAN with LIMONCELLO and so forth. You are guaranteed to find your favourite scent! All of our fragrances are chosen in such a way to make them compatible to each other. To combine them just insert two different fragrance-tablets into the dispenser. It doesn’t matter whether it is the AMBICAR classic or the Insilver model. Would you like to undertake a fragrance discovery tour? Click here! We only manufacture natural essences without the addition of alcohol – with which you can increase your well-being: create a comfortable, relaxed and safe atmosphere on your car trips. Our innovation is based on microcapsuled fragrances (= pleasant smelling solids) which are safe and easy to handle. You can control the release of the fragrances yourself by plugging the dispenser in or out. An LED indicates the status for you.